The Royal Concertgebouw Orchestra is one of the very best orchestras in the world. Time and time again, critics have lauded its unique sound, which clearly stands out among thousands of others. The RCO’s string section has been called ‘velvety’, the sound of the brass ‘golden’, the timbre of the woodwinds ‘distinctly personal’ and the percussion have an international reputation. The influence exerted on the orchestra by its chief conductors, of whom there have been only seven since the orchestra was founded in 1888, is also important. RCO Amsterdam is made up of 120 players hailing from over 20 countries. Despite its size, the orchestra actually functions more like a chamber orchestra in terms of the sensitivity with which its members listen to, and work in tandem with, one another. Indeed, this requires both a high individual calibre and a great sense of mutual trust and confidence. The atmosphere onstage, the orchestra’s roots in Amsterdam and the organisational structure (the RCO Board also includes members of the orchestra) all converge to create exactly the right circumstances for exceptional music-making. The musicians are allowed to shine, yet still share responsibility for the collective. They also share the aim of achieving and delivering the highest level of quality at every performance, an ambition that goes far beyond simply playing all the notes perfectly. The Concertgebouw Orchestra was founded in 1888. On the occasion of its 100th anniversary in 1988, the orchestra officially received the appellation ‘Royal’. 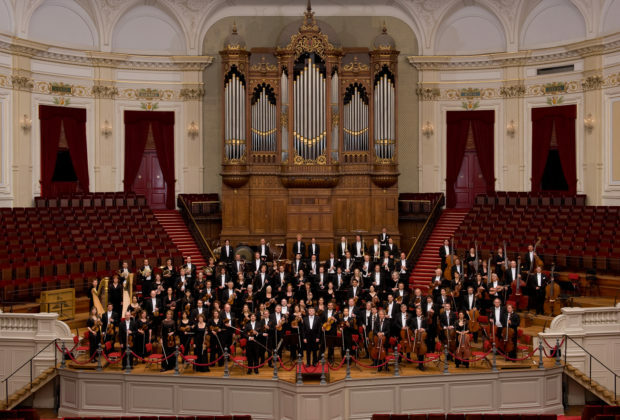 In addition to some eighty concerts performed at the Concertgebouw in Amsterdam, the Royal Concertgebouw Orchestra gives forty concerts at leading concert halls throughout the world each year. The RCO participates in residencies in Brussels (BOZAR) and Frankfurt (Alte Oper).